Of all the places I’ve ever been, I don’t think I’ve enjoyed anywhere as much as Canada. For sure, I’ve sailed to the North Pole, cruised around the Galápagos archipelago, gazed in wonder at the Great Pyramids at Giza. I’ve ridden horses along the trail in Montana, photographed penguins in Antarctica and walked along China’s Great Wall. 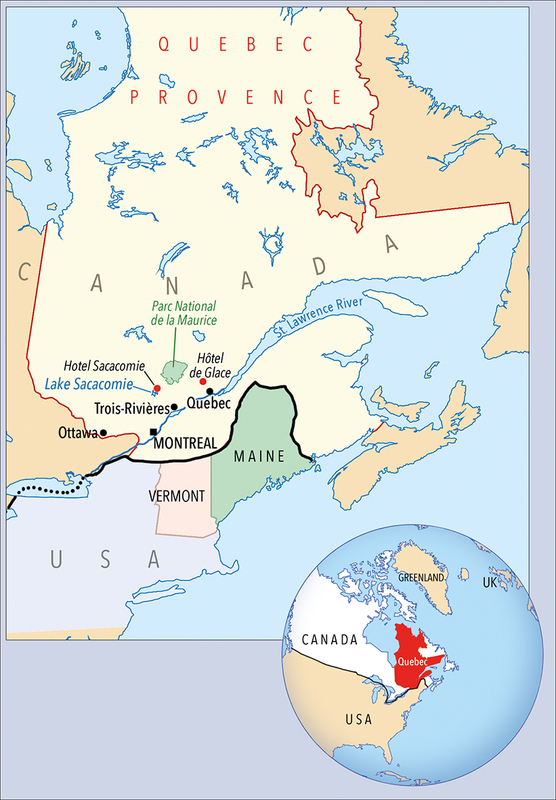 But, never have I had a more satisfying experience of travelling than on my many journeys to the wilderness of Canada. I’ve been kayaking in the Algonquin National Park looking for moose and wolf, marvelled at Niagara Falls, wandered around the fantastic art galleries of Ottawa and Ontario and even been to the Winter Olympics in Vancouver. But, my most recent trip to the land of the red maple leaf was, appropriately enough, the icing on the cake. ‘Appropriately’ because, as I landed in Quebec last February, I could see from the aeroplane porthole that the whole of Canada seemed to be covered with snow. What wasn’t white was either the blue of the sky or the green of the forests. The object of the exercise was straightforward enough: get into the great outdoors, eat on the hoof and take plenty of photos of what promised to be yet another Canadian adventure of a lifetime. No soulless hotels, fine dining or messing about with the trappings of luxury travel for me. Just a good old-fashioned expedition fuelled by piles of poutine (a Canadian culinary delicacy of chips, gravy and curds that squeak on your teeth like halloumi) and mountainous salt beef sandwiches as thick as a bible. There was plenty to do. So let’s get on with it. 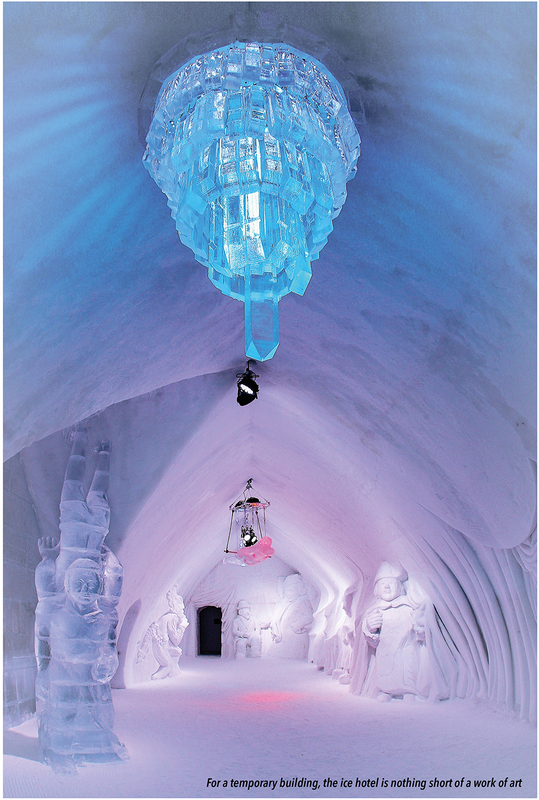 A night at Quebec’s Hôtel de Glace is definitely not for the faint-hearted. There will be many who simply don’t understand the attraction of sleeping on a gigantic block of ice. But for those exhilarated by the prospect, there can be few more enticing experiences to tick off your list. You might come away cold to the bone, but you’ll also be in possession of unrivalled after-dinner bragging rights. Let’s face it, no-one you know has ever thought to hang out in a modern day igloo-palace where the drinks really are served on ice, where the interior art takes the form of polar bear sculptures and the beds are raised monolithic platforms of frozen water (admittedly with extremely warm sleeping bags). Tucked away in the frozen outskirts of Quebec, Canada’s ‘only’ ice hotel (it’s a disputed claim, but there certainly aren’t many in northern America), is set among the deep green of the coniferous forest under a flawless blue, cloudless sky in which the bright sun certainly feels warm, especially if you’re wearing ski gear (or in my case polar exploration layers). As you arrive, you’re greeted by the sight of an impresssive series of ice constructions that, despite their very real solidity, will be gone in a few months. 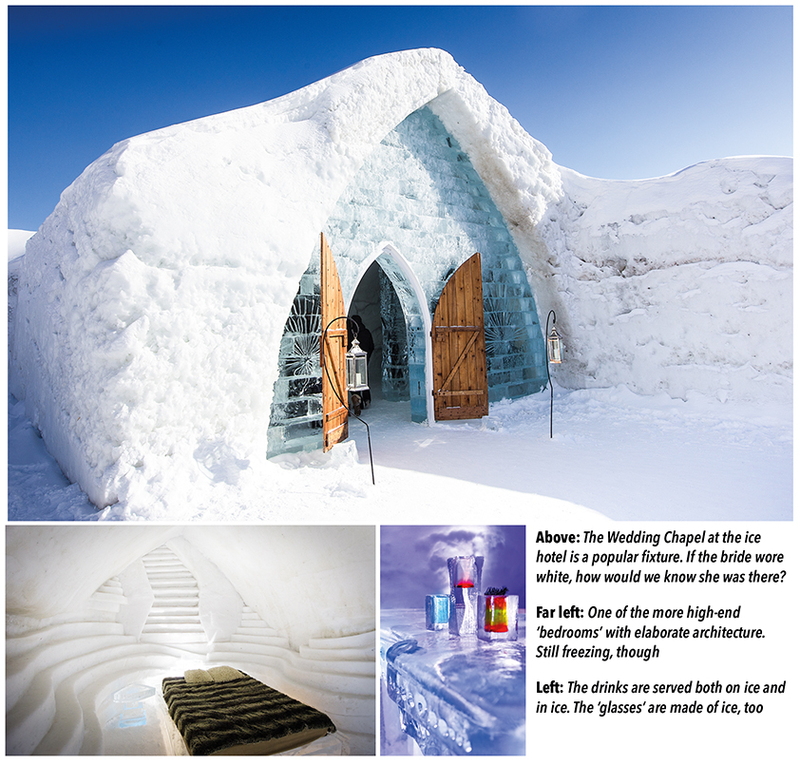 Every year the Hôtel de Glace is rebuilt from scratch and opens its doors to intrepid clients for just the months of January, February and March, when there is the guarantee of the prolonged sub-zero temperatures that ensure your temporary abode won’t melt from under your feet. Here, at the ice hotel, the 30,000 tons of snow and 500 tons of ice that go into the architecture are machine-made to a special formula. The ice is hardened and put in place by cranes, while the walls are four feet thick. If the out-side of the residential part of the hotel and its surrounding wedding chapels, bars and restaurants is impressive, then the interior – with its sculptures, grottoes and Jacuzzis – is nothing short of spectac-ular. Anyone expecting a damp camping trip is going to be sorely disappointed. The suites are like something out of a movie set, which in fact, they sometimes are. MTV films here, and Ice Road Truckers has sequences set in the Hôtel de Glace. The atmosphere is one of ‘mucking in’ and the sense of adventure is palpable from the moment you arrive. 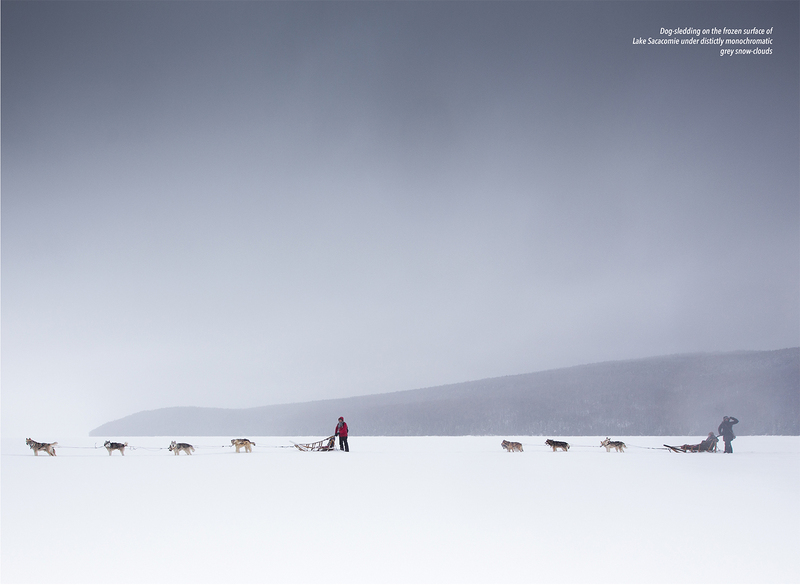 From the moment you leave the Hôtel de Glace and head into the interior you’re travelling in the real Canada. Oh, to be in Canada now that spring is here. Well perhaps not quite spring as we know it, but as I stepped out into the glorious February forests of Quebec I couldn’t help messing about with that most famous of lines from Browning. The air is crisp, the snow as white as paper, while the cobalt blue skies are, well, sky blue, only in a way that makes you think this might be the first sky you have ever seen in your life. 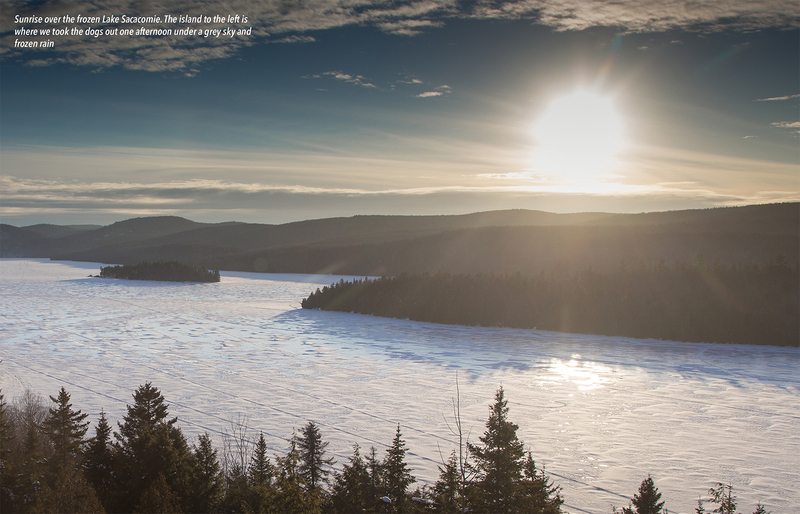 If you don’t fall in love with Canada’s great outdoors there’s something wrong with your soul… Perhaps not quite spring because it’s also 30 degrees of mercury below. When the wind gets up, you feel more like Apsley Cherry-Garrard and his chums on The Worst Journey in the World battling the elements in the seldom-trodden reaches of Antarctica, rather than a hiker going off dog-sledding with a bag full of maple syrup candies stuffed into the pocket. But cold aside, this is Eden, Narnia and Arcadia all rolled into one, where the grand, majestic landscapes beckon and your mind echoes to those long descriptive passages in Jack London’s The Call of the Wild. The wilderness calls you. It is a strong call, and you must obey. The Arctic dogs get extremely excited. 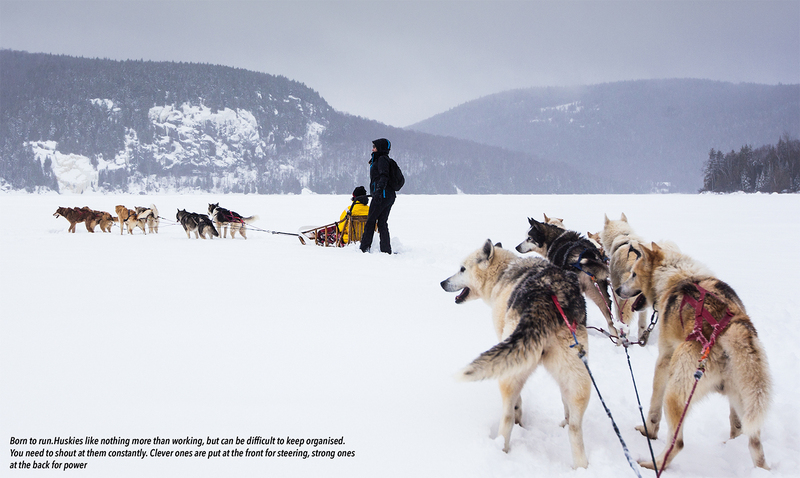 Clever, muscular and brimful of enthusiasm, they howl to be clipped to the harness, and soon we’re making ready to sled across the frozen lake at Sacacomie, flanked by great pine-clad mountainsides, camera poised for action. 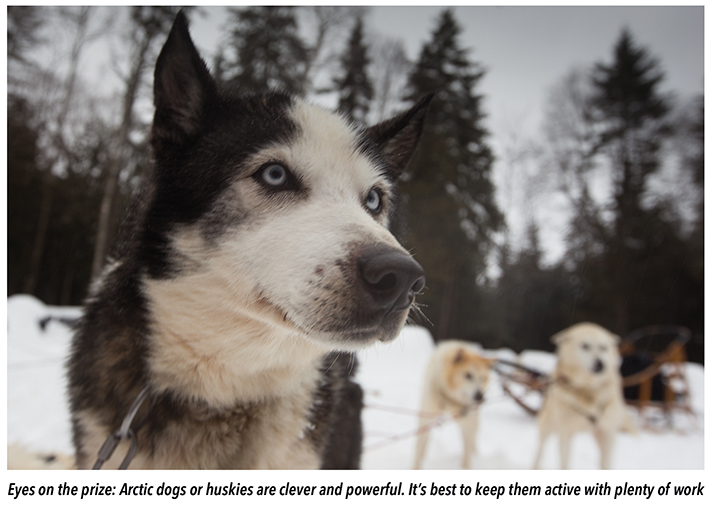 There’s only one rule when dogsledding: keep both hands on the horizontal rail that connects you to the powertrain, with both feet on the brake if you don’t want to go anywhere. And so fiddling with one of the dials on my camera with only a perfunctory connection to the vehicle, the six strong dogs, clearly hearing the cry of ‘allez, allez, allez!’ in their heads, set off like thunder rolling down from the Appalachians. Suddenly, my world turns upside-down, my camera flies about twenty feet away from me and I’m unceremoniously and painfully thrown onto my back. If I haven’t quite let slip the dogs of war, there’s certainly plenty of havoc to cry about. As it turned out, this was but the first and by far the least of my problems. I might have mentioned that these snow-hounds are nothing if not enthusiastic and, as such, find themselves with little time for whatI shall restrict myself to calling ‘bathroom protocol’. They do their business on the move, the resultant frozen deposits flicked up behind them the team races along. The scarf wrapped around my face is not so much a defence against the icy air, but an essential barrier to prevent one of the most unpleasant sorbets the world has to offer from making unwanted transit into the digestive tract as I breath heavily from the labour of sledding. I was on the point of wondering what might be the best way to clean my lens when the sky turned dark grey and it started to rain. With it came a new and serious headache, only this time related to the phenomenon that scares all photographers half to death: that of the entanglement of water and electronics. I suppose I was lucky in that my camera didn’t completely give up its ghost until we were heading back to the log cabin lodge in the failing light and black frozen drizzle of a long day. We unclipped the dogs, bade them farewell in an uneven wrestling match, and trudged back to the Land Rover with the quiet satisfaction of a job well done, the canines gleefully peeing in the snow after a heavy stint of doing what they were put on earth to do. As the unpleasant mixture of ice and dog ‘deposit’ started to thaw on my clothes, I knew that the first of my many showers would be a cold one, hosed down in the car park by a much-amused park ranger with icy blasts of water. Later, in the bar of the hotel, I stared at my lifeless camera, glass of wine to hand, and started to become worried. Only time will resurrect a water-damaged camera, and as I waited I felt a certain affinity with Dr Frankenstein as he waited for the galvanism to kick in and make his monster come alive. The first flickerings were unpromising: a screen of computerish junk that bore more than a passing resemblance to a crashed Space Invaders machine of yore. Menus spontaneously appeared and disappeared. The camera shut down. The camera booted up. Lights flashed and dimmed. And yet, somewhere in the innards of this electronic snowstorm were the images I had taken earlier. Sitting in the hotel bar, and several glasses of Malbec later, I watched camera do the decent thing as it started to behave itself. It had been a close run thing, but to my relief I at last had something to show for a hard day out in the field, frozen to the bone and covered in… well, you get the picture. 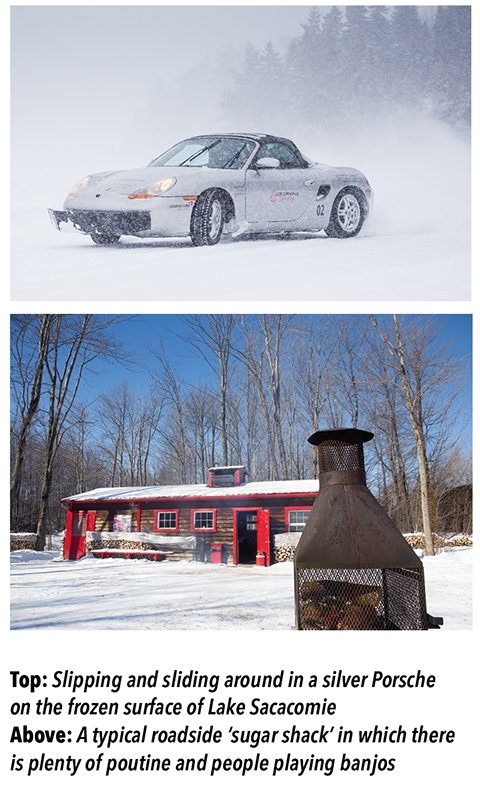 As the days rolled by at Sacacomie, there was plenty of hiking and ice driving in silver Porsches (which really is as much fun as it sounds. If not more.) But, before long it was time to head off on the long hack through the ‘big country’, past Trois-Rivières to the city of Montreal, pit-stopping at roadside ‘sugar shacks’ or cabanes à sucres, where there was, yet again, more poutine and corned beef sandwiches than you could shake a stick at. We spent some time making our own maple syrup ice-lollies in the snow, and hit the road for civilization. Montreal may be Canada’s second largest city, but for Europeans (while we can still call ourselves that) it seems tiny. Built around the small mountain of Mont Real (or ‘Royal Mountain’), it has the air of a big village bursting with poets, painters, musicians and cafés. 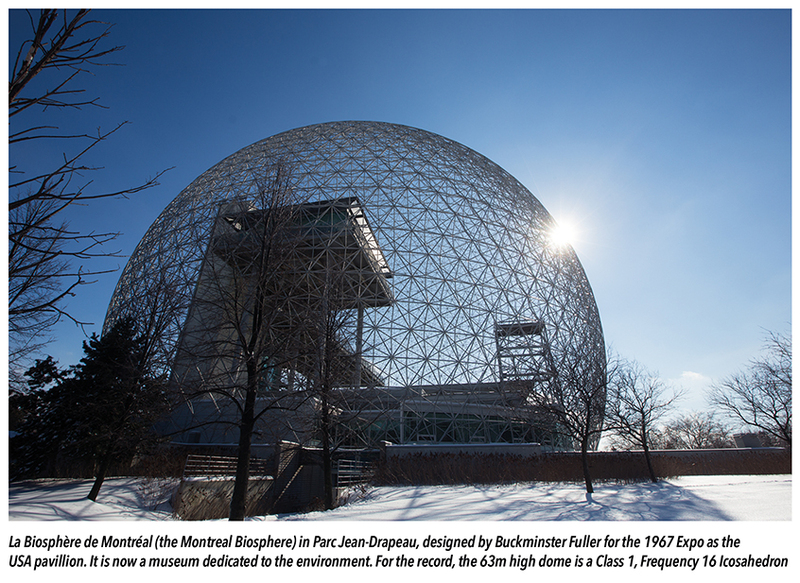 After a quick tour around the city, taking in the famous sites of churches, bridges and a geodesic dome designed by the wonderfully named Buckminster Fuller, it’s time to climb to the summit of the mountain. That may be putting it a bit strongly, because even if you take the toughest route up what is in reality not a very big mountain at all, the exercise will take you only a few hours, especially if you have snowshoes. But the views from the top are spectacular, and it’s a fitting place to say goodbye to Canada one more time, because from here on in, it’s all down hill. Back to the airport, back across the Atlantic and back to Blighty, where everything seems even smaller.